Armenia’s maverick Prime Minister Nikol Pashinyan is missing no opportunities to display his government tilt to the West amid a variety of opinions pertaining to this tiny nation’s future orientation. Hosted by Armenia in Yerevan under the theme, “Living together in solidarity, sharing humanist values and respect for diversity: source of peace and prosperity for the Francophone Community”, the two-day summit brought together Heads of State and Government as well as other official delegations representing the Organization International de la Francophonie (OIF) member states. OIF was created in 1970 to promote the French language, peace, and sustainable development. Amid developments unfolding around Armenia, when French President Emmanuel Macron and Canadian Prime Minister Justin Trudeau were in Yerevan to attend the Francophonie summit, the Armenian president and the parliamentary speaker were in Moscow to discuss the Kremlin concerns over the prime minister’s westward moves that keep Moscow anxious. The Kremlin, on the one hand, does not want to publicly demonstrate how disappointed it is over the ongoing processes that directly affect its policies. On the other hand, the Kremlin knows how prone official Yerevan is to the real dangers it started in the region back in 1990s, and that the occupation of Azerbaijani lands with Moscow’s open backing will not be forgotten by the people of Azerbaijan. Armenian President Armen Sargsyan’s “secret” visit to Moscow en route from the U.S., as leaked out by the Kommersant newspaper (https://bit.ly/2OsiueA), has once again revealed the continued advances of Yerevan’s overtures to the West and how unstable the Kremlin outpost in the South Caucasus is, where Moscow holds two key military bases to protect its national interests in the region that has long been a bargaining chip in the hands of Russia with the superpowers. Armen Sargsyan met Russian Foreign Minister Sergei Lavrov and his deputy, Grigory Karasin, in Moscow for dinner and called it “pleasant”. However, it was unlikely that the negotiations were just as pleasant, during which they talked about the temporary state of the Russian-Armenian relations, the situation in the republic ahead of possible parliamentary elections Prime Minister Nikol Pashinyan is insisting on to hold in December, the incident around Russia-led military bloc CSTO Secretary General Yuri Khachaturov from Armenia, against whom the new government of Armenia has brought a criminal case. It is clear that Armen Sargsyan acts as the “British queen” and does not decide anything in Armenia. Therefore, the negotiations were informal, according to Kommersant. The point the paper wants to focus on is stemmed from a desire to indicate that the Kremlin is coming to terms with a fact that Yerevan would be lost unless other means are explored. Nevertheless, apparently, they in Moscow decided to test the waters through the help of the “British queen” to find out the situation and moods in Yerevan and convey their concerns to the country's leadership. Especially against the background of the Francophonie Week that was held on October 7, which caused euphoria in the pro-Western segment of the Armenian society, and especially of Nikol Pashinyan. Many experts believe that the Armenian prime minister, after building the full vertical of his sole authority in the country that does not accept other options, will choose the final direction of the country's movement - to the West. And although it is too early to show it to the northern neighbor, Nikol Pashinyan truly makes “lovely and unconstrained selfies” with the leaders of the countries of the International Organization of Francophonie with children’s spontaneity, gives the head of the Canadian government Justin Trudeau photos from the KGB archives with his father taken in 1984 when Justin Trudeau’s father was in Armenia. Now, the paper says, we can say for a long time that Moscow’s mistake was a bet on Armenia as a country where there are practically no Russians, as well as no schools with teaching in Russian. But it is better to quote Armenian analysts, who are sure that Armenia has already abandoned Russia’s sphere of influence, and Moscow “is trying to establish new relations with Armenia under new conditions and is groping for the establishment of new ties,” as Lragir news agency reports. 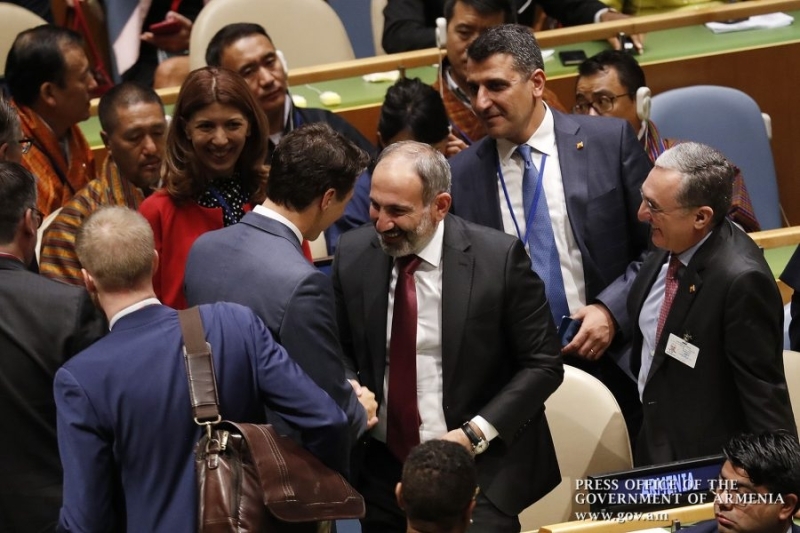 “Nikol Pashinyan, despite constant statements that there will be no reverse in foreign policy, is perceived as a politician of the same style as Macron and Trudeau. And with Putin, he talks about refusing to interfere in each other’s internal affairs,” the paper reports. Kremlin envoy Konstantin Zatulin, who recently arrived in Yerevan to offer opening the Lazarev Club in the country, complained that he could not meet with Nikol Pashinyan. The later, in fact, did not have time - he was in Paris, then returned to Yerevan, laid siege to parliament, called elections for early December, then again for two days to Paris - to the farewell ceremony of Aznavour and returned straight to the Francophonie summit,” the newspaper said. In other words, even such ardent pro-Armenian politicians as Konstantin Zatulin in Russian politics are not needed by the current Armenian government. Pashinyan is with Macron, Trudeau and the West. True, there is a small unpleasant nuance. For some reason, Pashinyan fans are not very fond of sexual minorities, although they should - this is a “western trick”. Supporters of the movement to the West oppose the gathering of gays in mid-November in Yerevan, which was already announced. The event will be called “LGBT Forum - Christians of Eastern Europe and Central Asia”. But, as the saying goes: a promise is a promise. Or the French equivalent and the French are now in fashion in Armenia: Vin verse il faut le boire - walk the walk and talk the talk. The policy of the new government of Armenia in relation to Russia is difficult to assess unequivocally. Thus, Moscow’s irritation is caused by the criminal prosecution of ex-leaders of the republic and the situation around the Collective Security Treaty Organization (CSTO). However, later Khachaturov was released on bail. On September 8, Armenian Prime Minister Nikol Pashinyan held talks in Moscow with President Putin and described its details in an interview with Kommersant as “brilliant”. “Following our meeting, I can say that the Armenian-Russian relations are now at a very high level. I would say that at an unprecedented high level. In fact, there are no problems in our relations,” the Armenian premier assured. And this week he said that he intends to meet with Vladimir Putin twice more by the end of the year, in November and December. Among the topics - the possible reduction of tariffs for Russian gas - not bad ahead of cold winter in Armenia and Moscow has still time to go the whole part of the road to finally decide on removal of Pashinyan and keeping him in power.